The Storm Within, is an exploration of art and science, focusing on the nature of neurological transformation. 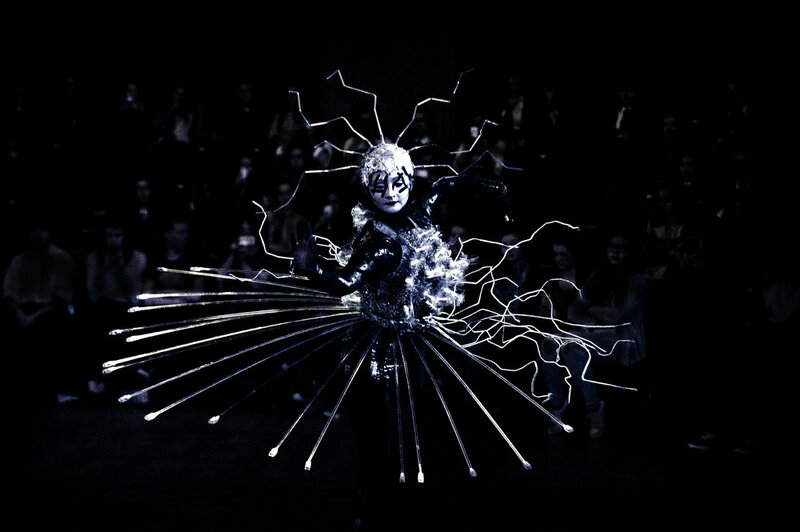 Through the medium of a wearable sculpture, the piece incorporates light and fashion design to convey the internal electrical processes of the brain and their effects on the body's health and wellbeing. The foundations for this piece have been built through explorations into the condition of epilepsy in particular, having been inspired by communications with epilepsy organisations and from my own experience with the condition. The work aims to reveal the transformative power of a seizure on a person, as it takes control of the brain and its faculties in an overload of electrical signalling in the brain. Uncovering this internal process aims to demystify to the audience the nature of neurological conditions and impress the reality that often such disorders can, without the person’s consent, take away freedom and control from an individual, in a process of transformation between the conscious and unconscious. The photograph attached is an image of 'The Storm Within' realised as a wearable sculpture. The design was created using LED and fibre optic lights, combined with metal and acrylic rods, moldable plastics and a printed lycra bodysuit.